Battleborn’s Free Trial, a free downloadable experience that grants unlimited access to all competitive multiplayer gameplay modes and maps, without any time limits or level caps. 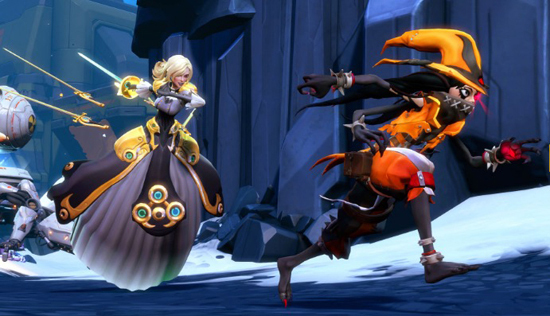 In addition to unlimited competitive multiplayer gameplay, Battleborn’s Free Trial also offers access to a rotating roster of six free playable heroes, which include the same character and account progression found in the full game. and will receive a slew of in-game item rewards including loot packs, credits, an exclusive “Founder’s Crown” Flair item and more. Flair are special pieces of gear introduced with the arrival of the Free Trial that bestow visual components on heroes, such as horns and headwear. The development team at Gearbox Software has been hard at work on Battleborn since launch, adding a ton of new characters, missions, features and gameplay improvements. The Battleborn Free Trial is now available globally on Steam and Xbox One, and will be available for PS4 players in the UK starting on June 13, 2017. To download the Battleborn Free Trial, head to the trial/demo section of your PS4, Xbox One, or Steam digital marketplace and look for the “Try Now” button, or simply search for Battleborn on any of those platforms’ stores.